A few years ago I couldn’t understand why everyone was so in love with shooting in Raw mode. I tried it and found it to be difficult for processing. As of a couple months ago, my feelings remained the same. However, now my opinion has changed 180 degrees. With the Canon 5D I’ve tried shooting both Raw and JPEG together, then I download the photos through the EOS Utility. When I click to open the files in Photoshop, JPEG images just open, while RAW images have a preview box that comes up first asking you to adjust all your size and color settings first. I find this tool is much easier to adjust lighting than using Photoshop adjustments. I’ve saved a few bad shots in Raw whereas taking the JPEG file in Photoshop and trying to adjust the lighting was cumbersome and didn’t look as good in the end. Some of the immediate correction within this Raw preview box include: White Balance, Temperature, Tint, Exposure, Recovery, Fill Light, Blacks, Brightness, Contrast, Clarity, Vibrance, and Saturation. You can also quickly select: Space, Depth, Size, Resolution, and to open it as a Smart Object. Raw mode is also smaller in file size than the jpeg/psd files I save out. So, I prefer to keep my raw file in each image library for future use. Then there is the advantage of batch editing. When you have a group of photos that all have the same lighting, of which you wish to correct, you can correct the entire set all at once instead of opening every file. 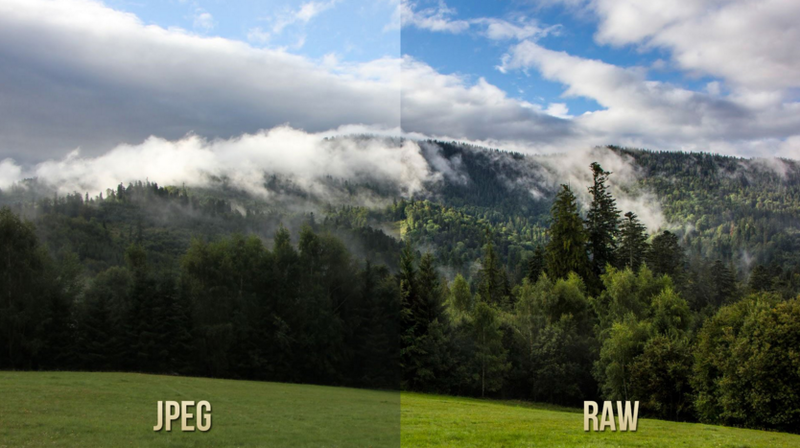 So now that I’ve seen the light (the lighting difference) between Raw and JPEG, I will never shoot just JPEG again – unless the picture quality isn’t important.